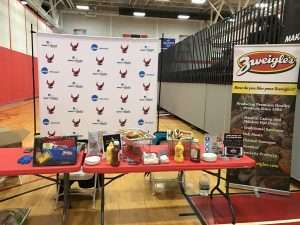 Zweigle’s is excited to join forces once again with Roberts Wesleyan College to throw a Zweigle’s Tailgate at the Redhawks Basketball game this Friday evening. We’ll be spending the day on campus, serving tastings of some of our favorite products to students in the Garlock Dining Room – Buffalo Chicken Sausage, Meatballs and Chicken Breasts. We’re excited to interact with students and hear how they like some of our lesser known products. Later in the evening, we’ll be moving our activities to the Redhawks basketball pre-game where we’ll give away free red and white hot dogs to attendees and host half-time giveaways. It’s a free snacks type of day! Join us from 5-8 pm at Roberts Wesleyan College on January 26th. We can’t wait to see you there!